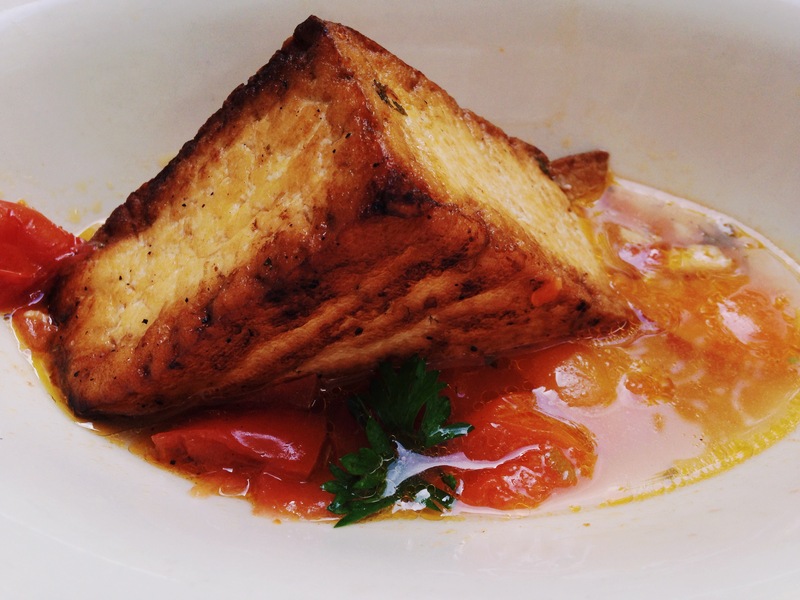 Have you ever heard of Acqua Pazza or “crazy water”? It’s an Italian tomato broth infused with olive oil, chills, and fresh parsley. Traditionally, its used to poach fish, but I made this version using local, organic tofu “steaks” cut on an angle. I carefully poked a few holes in the tofu and marinated it in sesame oil, tamari, a bit of powered ginger and garlic, and a pinch of chili for a few hours. Then I heated a generous amount of safflower oil in a cast iron skillet and seared the tofu slowly, turning it with tongs until each side was nicely browned. Placed in a bowl, surrounded by “crazy water” and served with bread that had been brushed with crushed garlic and olive oil and grilled, the presentation is simple and beautiful. If served with a nice salad and some fresh fruit to finish, it can also be an easy and impressive dinner-party dish — especially if you make the crazy water the day before (like I did). The whole meal comes together beautifully, and easily. And what a wonderful way to use the last of the summer tomatoes! I’ve included a link to the Food and Wine recipe from Marcella Hazan for tomato water, which I used (more or less) below.